Dr. Perkus is the creator of the The Aroma Freedom Technique. It is an entirely new approach to aromatherapy, one that uses the power of pure essential oils to instantly and irresistibly shift a person’s mental state, mood, and ability to take positive action. In this interview Dr Perkus introduces the process to help you know if this is a tool you need in your coaching tool kit. Benay: [00:00:00] Hello I’m Benay Dyor and welcome to another episode of Coach Pep Talk podcast. People who run their own coaching businesses each week I talked to an expert who shares wisdom that helps us be better coaches and better coaching business owners. 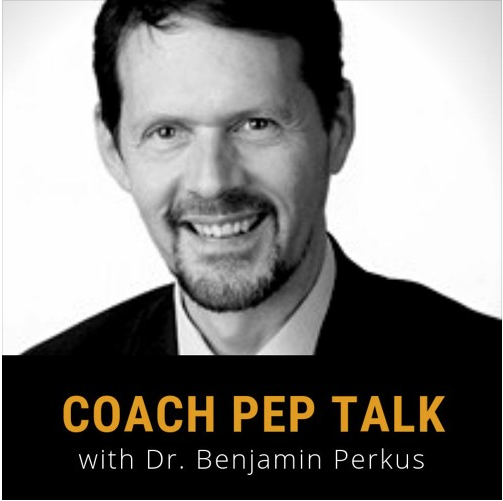 This week I have Dr. Benjamin Perkus on the line and he is talking to us all about a new coaching modality that he has created. I can’t wait for you to hear about it. It’s amazing. I’ll see you on the other side. Benay: [00:00:32] Coach Pep Talk is proudly brought to you by Life Coach Office, an online service that lets you easily manage your coaching business from just one platform. Some of the features that our clients really love are the ability to manage their client files all in one place, the ability to easily send invoices, and manage your coaching calendar, but the one that takes, it’s the icing on the cake is really the ability to set up your own membership site with just a few clicks of a few buttons and have your own online classroom just ready to go in about 10 minutes. So if you think Life Coach Office sounds pretty interesting, the best way to see if it’s gonna be a good fit for your business is to jump on over to our website and sign up for the free trial. You can do that at lifecoachoffice.com. Benay: [00:01:23] I’m deeply honored to introduce Dr. Benjamin Perkus today. He’s a practicing clinical psychologist and has been so for the past 20 years. He’s studied most of the progressive techniques for body, mind, and emotional wellness. He’s worked with adults and children, young and old, singles and couples. He’s traveled the world teaching people how to use essential oils and lifestyle strategies to optimize brain function, let go of the past, and enhance happiness and well-being. The most significant contribution he’s made to humanity, so far at least is an amazing new coaching tool, new modality he developed back in 2016 which I was lucky enough to see demonstrated live and was blown away with the power and the simplicity of it. It’s called Aroma Freedom Technique. Dr. Perkus Is going to talk to us today about this new modality and how you can incorporate it into your coaching business. Benay: [00:02:22] Now we get straight into the interview so without any further ado here we go with the first question.Can you tell us a little bit about what is Aroma Freedom Technique? Dr. Benjamin Perkus: [00:02:34] Sure absolutely. So Aroma Freedom is a process that I developed a couple years ago and its really integration of about 20 years of training as a psychotherapist in a clinical practice, combined with learning all of the other modalities, the tapping, and eye movements, and a lot of different things, kinesiology. I integrated a lot of them and I’ve been using essential oils for about 17 years and what I did is I created a process that integrates the two. It’s based on the principle of memory reconsolidation, that when we go back to a memory where something that happened, it could be a big trauma, or it could just be a mild disappointment, a frustration, anything like that, we develop negative thoughts. And those negative thoughts as every coach knows are those buggers that come back and haunt us later and stop us from doing the things that we want to do in life. So the process is a very simple 12 step process I created that starts with a goal. We set a goal, which in coaching that’s what it’s all about. Where do you want to go and how can we get you there? We set a goal and then through a series of questions we listen to that inner voice that tells us why we can’t achieve that goal and we end up going back through the feelings, generates the feeling in the body, back to those memories. Once we’re at those memories then we smell some very specific essential oils that they go in and they actually calm the amygdala so that as we’re thinking about that stressful memory we can’t feel that same frustration or disappointment or rage or whatever that is. Because we can’t feel that anymore because we’re smelling the oil, the memory just kind of dissolves. And as you saw on the demo you know the images kind of dissolve, the memory gets further away, and all of a sudden the negative thoughts are gone and the person feels more hopeful and positive about the goal that they’re working towards. And so we usually go a few rounds, each round takes about 10 minutes so by the time we done three or four rounds- so 20, 30, 40 minutes something in there. A person goes from feeling hopeless, frustrated, scared, whatever it is to feeling optimistic, confident. And it happens so consistently. We see over a thousand of thousands of sessions that we feel really confident that this technique is pretty much a go to for almost anything. Benay: [00:04:50] Yeah can you tell us a little bit more. I mean you’re talking briefly about how it came about like you’re combining all of these modalities but really what really drew you personally to pulling all these together to create this this technique? Dr. Benjamin Perkus: [00:05:05] Well I mean depends how far back you want to go you know. I got my doctorate in 1997 and started doing therapy with people and it took me about a week to realize that you know what I need some more tools. And just talking to people wasn’t quite doing it, and I felt like I needed something that would go deeper into the brain, deeper into the physiology, where people really are storing this stuff. So that kind of began my quest and I studied EMDR which is the Eye Movement Desensitization Reprocessing, which uses a lot of these similar concepts but then uses bilateral stimulation eye movements or tapping to reprocess and that is a great improvement over what they used to have, but compared to Aroma Freedom, it still kind of takes a long time and it can feel like you’re being hit by a Mack truck. Whereas, so I learned that. And then I was really impressed with kinesiology, with muscle testing. Some of you may be familiar with that and there’s a lot of systems out there for muscle testing. That’s really where you’re asking the body you know, because our body remembers everything so you might be able to ask your body what the origin of this issue is and maybe you go back to a time frame and it says seven years old, the feeling is anger, and you’re feeling it your liver or something like that. And then might use some modality to clear that out. I was really impressed when I had different sessions. I took some trainings on that. And yet one of the problems with kinesiology is that it’s not duplicatable. It’s something that you have to keep going back to the person over and over to get that treatment. So I always thought, well what could I create that would allow people to actually help themselves. I’m really kind of into self-help and people taking responsibility for their own state and having the tools to be able to shift their state as needed. And so that was kind of in the back of my head, how to do that. And then when I get introduced to the essential oils back in 2001, we’ve loved them for all kinds of purposes, we’d love them just for simple things like clearing sinuses or for smelling good or for you know belly aches or calf pain or anything like that. And I didn’t really know how to use them in my psychology practice. I kind of felt like I was wearing two hats, that you know by day I was a psychologist and doing all these cool things and then by night and weekends I had this essential oil thing. My Wife and I were training people in Young Living Oils and we loved that. And I didn’t really want to let go of either world, but I didn’t know how to bring them together, because in a lot of therapists especially, and coaches probably feel this way as well that They kind of know intuitively that the oils are calming or relaxing, but they don’t know well how do I specifically use them in a session. And it was really a few years ago that I was speaking to one of my mentors and she thought about it for a minute, because I said how I felt torn between these two worlds, and she thought about it. She said you have to create a tool; you have to create something that allows other people to do what you do. And that was kind of the seed. That about six months later I kind of felt something welling up inside of me and I got to thinking, well how do these oils work? And I kind of start to go deeper in my mind and researching it and then I was on a trip to Asia and I was teaching some of these techniques that I’d created for using the oils for trauma and I get terrible jetlag when I travel overseas. If went to Australia I’d probably never sleep, so it takes me like a good two weeks to recalibrate. So I’m in this beautiful hotel in Singapore. Can’t sleep at all. Two in the morning. so I’m down in the lobby every day, well okay I may as well start writing. So that’s when I started putting all that everything on paper and I came back from that trip and I told my wife, you know that book that I have inside of me. Well I think it’s time. And at that time it was April 19th, I remember the day, 2016 and the oils convention, the Young Living Convention was on June 16th, so I had two months. So I said OK I’m going to write this book in 30 days. And I said I’m going to go to the library every day and I’m just going to write it. And so at that time I didn’t even really know what the book would be about. But I started just taking notes and I started playing around with all these pieces that I’ve gathered over the years. But what if I put them in a certain order? You know we set the goal and then listened for the negative voice? And that was really the key, that negative voice, that subconscious voice was really the key to finding out where they come from. But then find where it is in the body and name the feeling in each of these steps. I didn’t create any of the steps, but by putting them in order it’s kind of like one of those locks, the combination locks, if you do them in the right order it unlocks, so that’s what happened. I found that I put the steps in this twelve step process. I took myself through each one and all of a sudden my negative thought went away. And I said well that’s pretty cool. I tried it with my wife. Same thing happened. Tried it with my clients. I realized I was on to something because Everyone was having the same results. So that was great except I was down to 15 days left to write my book and I still hadn’t written. So I said I’m going to put it to the test. I’m going to write a book in 15 days. And that was kind of my goal statement that I set and I took myself back. Sure enough there was negative thoughts, how nobody can do that, too much pressure. I took myself through the process, smelled the oils, after about 10 seconds of smelling the oils once I was focused on the memory, I was like oh 150-page book that’s just ten pages a day for 15 days. How hard is that? And I was just at that point I was free. I knew I could do it. I told my wife I’m going to go to the library every day, I’m going to write my 10 pages. And it took about four or five days of writing the ten pages before I could actually see the whole project. And then I go, Oh I’m actually writing about a technique. And so by then I just I knew it was going to come out of me, by the end of the 15 days the book was done. So that was kind of my first success story with it. And what was interesting was I found that I thought that I was at the top of the peak of the mountain, and a lot of people can relate to this, you just achieve a big goal. You think I was writing a book and I wrote the book, great! My book is written; my work is done. Well that is far from true because once you create something then you realize the peak of the mountain is actually just a little peak and then there’s a valley ahead of you. You have to go to get to the bigger peak. I still had to create a Website and get it edited and get an ISBN and all these things I didn’t know how to do. So every time I would feel frustrated I would do the same thing. I would use the process and that’s when I realized is what we really have here is a tool. anywhere Where you are on your journey of success, you come across a boulder that stopping you, this is going to get you moving again. And so even if you don’t know, maybe you have to learn some new skills, maybe you have to reach out for help. But the important thing is to not stay stuck and that’s what a lot of people obviously they come to a coach because they’re stuck in some area of their life. So that’s where it’s such a beautiful synergy with people who are using this in coaching. It’s because coaches are already helping a person reach a goal and is already standing alongside them giving them the tools they need to get past it. Well. So for instance, I’ll give another quick story. I realized I couldn’t edit my own book because you know, I knew what I was trying to say but you know and I’m a pretty good speller but still you can’t edit your own book. So as it happened, you know we had been led universe, God had led us to Virginia to live for a few months and our best friend down there she said, oh well I used to be an editor, so let me come over every day and I’m going to help you edit the book. So every day she’s coming over and, remember by now the 30 days are up. So we’re down to like we have three days to edit this thing. So we’re working really hard and at one point I’m sitting there with her and my brain just shuts off and I’m like, um I don’t know what to say now but I can’t even formulate a sentence. So I said let me take a walk, you know kind of chill out. I took my oils with me. I was smart enough to do that and I’m walking along I’m thinking well maybe it’s emotional. So sure enough I do the process on myself and you know I go back in time, I do the process and this memory pops up I had not thought of in 30 years and it was a time I was in high school and I was on the track team and was running the one-mile race. I’d never run the mile before. I’d never done much running before, But I was excited so the starting gun goes off and I just start sprinting. And so after the first lap, it’s a four lap race, after the first lap I’m ahead of everybody, so I’m thinking this is great. After the second lap I’m still ahead of everyone, I’m thinking I’m going to break records, I’m gonna be in the Olympics and then you can imagine what happens. Right, I’m sprinting and so after about a half a mile, I’m done and my legs just stop working and people start passing me on the left and right. And I didn’t realize this so I finished maybe fifth or sixth. But you know in that session, when I go back to that memory, I’m breathing the oils and I catch this thought. You’re not strong enough to finish. I realized that I had created, without realizing it, I had created this negative thought that was still sitting there in my subconscious and now that I was engaged in this process of sprinting to finish the book, It’s like, nope that’s dangerous. I’m going to shut your brain off so that you cannot finish so that you’re not going to have to face the embarrassment of trying to do something that you can’t do. Dr. Benjamin Perkus: [00:14:06] Wow. So That was a big learning like we all have hundreds or thousands of these little things we’ve created. So I smell the oils, memory dissolves, my brain turns back on and I’m able to go in and said OK I’m ready to go finish the book. We got it, we were so close. We got it done. We had to have it shipped. I didn’t even see the book until the day I arrived at convention ready to sell it. So, but it worked out. But ever since then I created the book and then people wanted to be trained in it and everyone was like, well can we get certified in this? And I don’t know maybe in a few years? Like it never occurred to me to do certification, but after the third person asked me that, I’m thinking well maybe I’m blocked because apparently the world wants this certification. I haven’t created it yet. So once again I do a session on myself. And same thing. There’s these negative thoughts there. How much you going to charge? How are you going to make sure people are competent? How are you going…? They’re just negative thoughts. I do the process, negative thoughts disappear, as soon as there’s no more negative thoughts. I just download. Oh it’s gonna be an online class, here’s how many weeks, here’s what I’m going to charge, and so I put it up on my website. Go back to sleep, this is in New York now I’m back living. Go back to sleep. And by the morning five people from Singapore registered for certification. So I said OK well that’s what happens when you get out of the way and these things can start to come through you. And so it’s just been a journey ever since and I created an online academy. I have certified practitioners in twenty-six countries and forty-seven states now. And it’s just spreading because it’s simple and because people can use it on themselves and others and it’s easy to duplicate. And so it’s kind of become this this phenomenon that my job now is just to kind of stay ahead of it and make sure that people are doing it properly. And so in a nutshell that’s kind of the story of how I got it. Benay: [00:15:57] That’s an amazing story, it’s incredible. A couple of things that amazed me so much when I watched the demonstration that I was lucky enough to be a part of, and I’m trained as a coach and an NLP and that sort of thing, is just how simple it was and how whatever the client said was just perfectly fine and you didn’t have to question and requestion and dig and she really found her own answers without too much pushback or, I don’t know what the right words are, it was just so, like I would have said or I would have phrased that differently, you know my coaching brain was saying these kind of things, but It didn’t matter, like she just sorted herself out. It was incredible how easy it was. I don’t know if you want to add anything or say anything? Dr. Benjamin Perkus: [00:16:53] Because well because what we have with Aroma Freedom, is with each step it’s like a treasure hunt. You know exactly what you’re looking for in that step. So as a practitioner once you’ve heard what you’re looking for you don’t have to engage in the story. That’s kind of I think what you’re trying to say. Instead of engaging in the story, OK. I got the negative voice. OK what’s the feeling? Got the feeling. Where is it in the body? Got that. OK. Where’s the memory? Got that. OK. Then we smell the oil. Because we know what we’re looking for in each step, it is so efficient and people can clear years of stuff in one session. Some people say oh that was like ten years of therapy you know. So it’s because it’s a step by step, and I will say that some of the people who actually struggle with learning it a little bit are the more highly trained professionals who already have a toolbox and they already have some great things that they know how to do. So they have a natural instinct to do that. But we say you know leave it at the door. Learn this process. Its super simple. Once you’ve mastered it, then yes figure out how to integrate it, where you’re going to put it in with your practice. But yeah so it’s a process. You got to just trust the steps do the work for you. And it’s really pretty easy as a practitioner. Benay: [00:18:00] Yeah I think that’s the thing that just really blew my mind. It didn’t matter how the client communicated, if she used disempowering language or she would of used things as a coach I would be trained to go for and sort of want to open up and explore. But no, you just leave it at that language because you found like the piece of treasure that you need at that one step. So a Really really powerful tool. Before we move on, can you talk just a little bit about the power of smell? Because I mean we have all these senses, and in coaching we do a lot of VAK, visual, auditory, kinesthetic. We don’t often use the olfactory. Dr. Benjamin Perkus: [00:18:35] You know that’s a really good point. I’m familiar with the VAK, there’s no O, right? There’s no O.
Benay: [00:18:43] Yeah, where is it? Obviously the key! Dr. Benjamin Perkus: [00:18:43] It is. And I talk about that in the book, the sense of smell. It’s the earliest sense to develop, it’s actually fully developed still in the womb and it’s the most primitive and it’s the most closely tied to survival. So even with single cell organisms, if you actually study the biology of this, Single cell organisms, a protozoa swimming around has the ability to detect, is this chemical that I’m coming towards. Is it safe or dangerous? Is It a poison I need to run away from or is it food that I need to go get? And that developed into the sense of smell and you can see animals use it the same way. So just everyday example, think of if you take leftovers on the refrigerator and they’ve gone bad, and you open up the container and you smell it. What do you do? You recoil. And that’s because you’re like, and you cannot eat it, like your brain, unless you’re going to die, you literally can’t eat it because your brain has these sensors called the amygdala which is the fight or flight trigger. It does two things in the brain. It detects fight or flight whether we should run. The other thing it does is it processes smell. So it goes directly to the amygdala and we need to, and It tells us that’s not safe. There’s no way I’m gonna let you eat that. On the other hand, in religious rituals all over the world they use incense. Why is that? Because the sense of smell also can have that instant calming effect, helps us let go of the stress of the everyday world so that we can get more centered and balanced. So the sense of smell it’s automatic. It’s primal and it’s irresistible. So by using that, that’s why it’s so fast, number one. And you’ll see these sessions go very fast. This session of 20 30 minutes, that demo you saw was 20 30 minutes and, boom huge transformation. It’s fast. Now the reason it’s gentle, it’s because of the oils that we’re using in specific and we mix a blend of frankincense, lavender, and the Young Living Stress Away oil, which has vanilla in it. And each of those there’s a science behind what they do in the brain to each work in different ways to calm the brain. And so by combining those and you smell the oils as you’re focusing on the memory, what happens is that the feeling is kind of the glue that holds that memory complex together and the sense of smell when you come in and you hit your brain with these oils that are very calming as you’re focusing on that stressful, upsetting situation, it’s almost like your brain gets confused, it’s like Wait a minute I thought that was a terrible thing that happened to me but now I’m smelling this and I feel OK. You know what, I guess I survived that I guess I’m powerful. I guess I can do this. So what happens is as that memory breaks apart because we’re, in a sense we’re kind of hijacking the memory with the sense of smell with the oils because once the memory breaks apart something opens up within us independent people’s belief systems, for some it’s the Holy Spirit comes in, some people get a word of scripture, some people just feel a sense of confidence or they’re their logical brain is saying that’s no big deal or I can do this. So all those things open up once we are using that sense of smell is kind of coming from underneath it and break it apart. Benay: [00:21:53] It’s amazing how powerful it is. OK let’s talk about for coaches you already have a coaching business or maybe you’re just about to start their coaching business, how do you see this as a useful tool for their toolkit, for those coaches? Dr. Benjamin Perkus: [00:22:09] Yeah absolutely. We’ll let me speak for two sides of it. So first let me start with the coach themselves. Because It really is designed to be a self-care tool and you know if you’re embarking in a new career there could be some anxiety, there could be some nerves, there could be some confidence issues. You know maybe they’ve never charged for anything in their life before or they don’t know Am I going to provide good value, or what if I can’t find clients, or all the things coaches might be thinking of. So first on that side using it for a coach to get clear on their own goals, their own… Where they’re headed and then clearing those things out so that they can move forward whether they need to be doing things with marketing or that sort of thing. And then obviously when working with clients there’s several ways you can use it. The way most of the coaches that were in our program use it, is they start out a coaching session with kind of the usual, like how’s it going and you know let’s follow up on the action steps from last week and you know where are you now, that sort of thing. And then they’re kind of using their skills to help distill and identify where there might still be a block. or What is the next hurdle to be jumped. And then they work with the client to kind of formulate that goal statement and that’s half the work, it’s kind of getting clear and where it is your block and what makes a difference. And then they might break into and use the Aroma Freedom process in 20, 30, 40 minutes depending. And then afterwards, same thing, they can kind of use their coaching skills at the end for the follow up, for the accountability, that sort of thing. Maybe some sessions they don’t need an Aroma Freedom session and some they do. So basically in whatever process that you use, whatever process you’ve been trained in, you can bring this piece in when you’re with a client who is stuck in some way. Benay: [00:23:57] Do any of your coaches use the technique in a group situation? So they facilitate the process for a group at the same time? Is that possible? Dr. Benjamin Perkus: [00:24:07] Absolutely. Yeah. not only is it possible is it’s amazingly powerful because the nice thing about this process is I could lead you through a process, I wouldn’t even need to know anything. You don’t have to tell me the goal necessarily, you don’t have to tell me the feelings, the memories. It’s your process. I’m just kind of guiding you in that. So I didn’t when I first created it. I did not envision it being me doing these online groups or in person. But then again with the first person hired me to do an online group I did it through the process. I didn’t know what everyone’s goals were. Now there’s ways of doing it, say if you’re doing it online, where we can have people be sharing in the chat as much or as little as they want. And it kind of helps the facilitator see where people are. So when you do it in a group each person kind of describes their own session and the same thing goes for in-person groups as well. You know I’ve been in groups of three hundred people leading everyone, it’s very smells very good by the way. 300 people through the process and you know just like any kind of a normal curve distribution you’re gonna have some people that have life changing experiences in that, most people are gonna have a great experience and then there’s gonna be a few people that they really needed in person. So I want to you know there’s not one size fits all. You can help a lot of people in a group process as long as you also put it out there that you know if this wasn’t the right setting for you I’ll follow up with you individually on that. Benay: [00:25:38] That’s great. Yeah. Good idea. So are there any kind of niches that this works better with than others? Or any coaches that are trained in specific modalities or…? Dr. Benjamin Perkus: [00:25:50] You know what’s really cool is to see all the creative ways that the coaches use it. I have one person, very successful, she is a midwife and she uses it. She really feels a calling to help women who want to have a VBAC want to have a vaginal birth after Caesarean. And she realized how much birth trauma from the standpoint of the mother there is. And you know giving birth, I’ve never giving birth myself, but from what I understand it can be kind of intense and sometimes it goes great, and sometimes it doesn’t go so well even if it ends up OK. So just like any other could be terrifying, could be frightening, overwhelming, any of those things, there are some residue. So she uses Aroma Freedom to go in and clear out the trauma from that. And she’s had amazing results with women. One woman she had had seven caesarean sections and after this process her eighth child was born vaginally because she let go of the emotional. So it was used for that. I would say kind of generally speaking, anytime you’re dealing with some like procrastination or being stuck in some way, so business people that are overwhelmed and stuck, you know this is a good niche for it. But there’s no limit you can take it to. we Have a woman in Japan who is using it with a professional golfer and you know professional sports obviously, it’s all in your head as well you know, and mentally being there, overcoming any doubt, overcoming times of failure in the past, you know clearing those things out. So it’s really broad and so people just bring their interests. They bring you know, if you’re interested in helping people you know, who’ve been assaulted then you can use this process for that. If you’re interested in you know helping people who want to perform better in something else. You bring it for that. So whatever you want to bring it in for. Benay: [00:27:43] Yeah, in the demonstration that I saw was a woman who was trying to lose weight. It was great for her for that as well. What about business coaches or you know, in corporate environments? Have you seen much of that yet? Dr. Benjamin Perkus: [00:27:57] You know that’s an area that we haven’t really broken into. We kind of imagine the possibilities and it’s really exciting to see what will happen. I think that you know in the beginning the first people who jumped on this were the ones who already were convinced of the power of the oils and so they already had that down and They were so excited to show, that we’re showing them how to use them in a step by step process. I think that as we progress you know we’ll be working more and more with people who maybe never used oils before. They’ve even never cared to. But they have a specific need such as, you know, motivation issues in the workplace, or focus issues, or something like that. And then we start using this with them. And the same principles will apply. So that’s really exciting to see how that’s going to unfold as we go. Dr. Benjamin Perkus: [00:29:10] Yeah Overwhelm. Public speaking. Of course that’s you know success in business at some point. You got to get in front of people at whatever level. If there’s anything in you that is resisting that that’s really good to knock that stuff out. Benay: [00:29:26] Great. So Obviously it’s very flexible for all kinds of coaching niches. OK, let’s see, do you want to talk a little bit about how it works or do you think somebody would be better off just coming to see a demo? What do you think for our time together today? Dr. Benjamin Perkus: [00:29:43] Yeah well I’ll just kind of I’ll just kind of… how many more Minutes do I have? Benay: [00:29:49] You can have as much as you want. Dr. Benjamin Perkus: [00:29:52] Seeing it, there’s nothing like seeing a demo to really kind of get it but I’ll just kind of sketch it out in a broad form that I made it so that every session in one sense stands on its own. You always want to leave someone better than you found them. And so this definitely does that. So we start by setting a goal and setting a goal really is going to determine whether it’s going to be a smart goal whether it’s going to be a specific, measurable, time limited goal, but you want really a good juicy goal that’s exciting but also a little scary. You kind of want to find that sweet spot and you know with the goal setting. And then you rate it, you rate how possible does that feel from zero to 10? and Zero is you feel hopeless, that this could ever happen, a 10 as you’ve totally got it. And I love working with zeros. I love working with people that like start out, there’s no way on earth this is going to happen. That’s the best. But and I would say if they start out, their already an eight or nine, I say you know you may not need the technique for that. if You know that you can do this and what we’re looking for is that goal that it’s like that big hairy audacious goal that you really want it. But you don’t know. Like I knew I could write a book, like I never doubted I was a good writer, in college and everything. But I didn’t know if I’d read a book in 15 days. So like that intense you know that big goal in a short time was the right level of excitement for me and the right level of scary. So we’re setting our goal, we’re reading how possible. And then we do something really cool. We pause. We listen. We say what is the negative voice in your head say that tells you this can’t happen. And you listen. And everyone has a negative voice. And we talk about this in coaching all the time of course. It could even be like a voice just like ha ha, That’ll never happen or Yeah right. Or it could be you know, you’re not good enough, or you know your mother wouldn’t approve or whatever it is. So you hear that and then we say well how do you feel when you hear that voice? So what that’s doing now, that’s tapping into the feeling and I say it’s really important to find the one word feeling. And this is sometimes stops people in their tracks because they’re used to saying well I feel like he doesn’t love me anymore. Well guess what that’s not a feeling. That’s a judgment. And we talk about feelings versus judgment .so I say Okay well so when you judge that he doesn’t love you anymore, What’s the feeling? And then they like, oh sad. OK now you have something to work with. OK. Where do you feel that your body? And every feeling is somewhere in our bodies and by spending some time getting them to focus on that kind of like there’s a computer program that you want to shift on your hard drive. You got to pull it up onto the screen before you can modify it. So it’s the same way. So where you feel your body? Now next step, step five, now connect with that feeling in your body, drift back to an earlier time when you felt the same way. And people are always amazed at what comes up, like in my case memory from 30 years ago which I hadn’t thought of in 30 years. Why did I think about it? Because the feeling was the same. It wasn’t the context, context of the same. The feeling was the same. So drifted back. I found This memory pops up, and I tell people, the first one that pops up is the one you go with, because people have a tendency to say well that couldn’t possibly be related, let me look for something more complicated. No. So feeling pops up and It could be a snapshot of a specific time or it could be like you’re watching a movie of a whole bunch of times. Once that pops up and about 10 percent of the time there is no memory, but that’s OK, we just say breathe the oil into the feeling. but Most of time there’s gonna be a memory you’ll see something. That’s when we get out the oils and we use the Young Living oils, we use the frankincense, lavender, and Stress Away. we mix them together into a memory release blend, we call it. Breathe them in and they take about 30 seconds or a minute. You’re breathing the oils into the memory and I tell people to focus on that memory breath the oils into the memory and watch what happens. And then as a facilitator I’m just silent and letting them do their process. What happens is people’s shoulder start to relax and I say Well what happened. They say oh it just started to drift away. Or they might say the memory seems further away or it kind of pixilated and dissolved. Most the time something like that will happen. Once in a while someone will say Oh well I just got reminded of something else that’s related. so Sometimes memories trigger another. So whatever happens its fine. OK so now we’re done through that processing. Then I say OK let’s go back to your goal and let’s rewrite how possible the goal feels now. So let’s say your goal is Yeah I write I write a book by December, whatever. and Maybe you were at a three before. How possible does it feel now? Usually People will jump one, two, three points. So I’m about five. OK so what does that mean? It means that I feel more positive about it but I’m still not totally convinced. So we say OK let’s do another round, go through the same process. Listen in. What is the negative voice? What else is the negative voice saying that tells you this can’t happen? And they say Oh you’ll never do it in time. How do you feel? I feel overwhelmed. Where you got your body? I feel my heart racing. Drift back to an earlier time. I remember you know when I took the finals in college. OK. Breathe the oils into it. The memory does its thing now. Oh, now I’m about a seven. OK so you do it until there’s no more negative voice. Takes usually 20, 30, 40 minutes depending. And then after several rounds, they’re at a nice high number and I say OK is there anything else the negative voice is saying? And they so no, I got this. I know I could do this. Okay great. Now we move to the closing phase. So this is where we kind of tie it all up. We say OK now let’s create an affirmation that expresses what you just learned. That expresses this new positive voice. And it could be as simple as I got this, or I write my book by December, or I am enough. So sometimes a simple affirmation is really good. Sometimes it’s a restatement of the goal, but now with a new positive energy and what I tell people is that affirmations are great except when there’s something in your brain that is fighting against the affirmation. So this is why we don’t use the affirmation until after we’ve cleared out the negative voices. If you use them beforehand if you try to assert I write my book by December, and the negative voice is saying no you’re not, no you’re not, you’re just fighting. But now when you say I write my book by December. There’s nothing new that disagrees. It’s a one sided conversation. So like yeah you got this. So then we do, we add in another oil, we have a great oil we use for that transformation. Same thing you smell the oil and now you’re anchoring, we know from NLP, you anchor a specific sensory experience, which is a smelling this delightful oil, with the affirmation. You do it in a power pose because we all know about the effect of body state and how that affects our state. So you choose a power pose that feels consistent with that affirmation, you smell the oil, you’re in your power pose, you do that for a minute or two until it kind of really anchors in. That’s Step 11. And then step Twelve is your positive action. Okay great, now that you’re on for this goal, you know you’re gonna achieve it, You’re confident, you’ve got to put it in action. So in my case I knew my positive action was I write 10 pages a day. If I got just through Step Eleven but never wrote the ten pages a day we wouldn’t have the book. So you got it. The rubber has to meet the road. So you work just, you don’t have to create your full action plan there but at least the very next step. And sometimes people they already get it intuitively as they’re doing the affirmation. Someone pops into their head like Oh I think I need to reach out to Benay again and I need to you know sign up for this thing or you know I need to call that banker that I met last week and we talked about how they might need my services. You know your intuition starts to amplify and you start to get a hit at Here’s what my next step is gonna be so. And then those are the 12 steps. So it’s really neat is that you can at any point in the process, you can say, let’s say you run out of time and they’ve made some shift but they’re not fully there yet, you can still kind of tie it together with the affirmation. But more often than not a person is really just glowing by the end and you see that I think you saw a demo of one person but when you see a demo of one hundred people and at the end they’re all like so happy because they just let go of something and they feel great. It’s really exciting. So those are the 12 steps. And interestingly I was … people Say well how long do these affirmations for? And you hear different things, some people say I’ll take 30 days to make or break a habit. Some people say 21 days. I Was playing around with that as I was developing this and I found for myself, so what I said was say the affirmation afterwards for three days, two minutes in the morning, and two minutes at night. And this comes from the research of Amy Cuddy with the power poses, she said two minutes in the power pose raises testosterone and lowers cortisol. So I said ok, with two minutes morning and night in the power pose, doing the affirmation, smelling the oil, and I found for myself that after about three days it seemed like I didn’t even need the affirmation anymore because I had I had kind of integrated it. And so I actually I saw Greg Braeden speak, so a year after I wrote the book, I was at a seminar. Greg Braden was speaking and get this little video up on the screen and it was showing these two nerve cells kind of growing towards each other like a time lapse photo, it was so interesting to see them like growing towards each other and finally connecting. And he says you know researchers have found it takes three days to build a new neural connection. OK well that explains it. That’s exactly what we’re doing, we’re actually creating a new neural connection so that now when you think of writing that book, the neurons are like, yeah let’s go for it versus before when you thought I’m gonna write that book the neurons like, oh no but what if something happens and oh I don’t know how to do it and that sort of thing. So your kind of you’re getting rid of that old programming, that old…you really are unlocking the neurons and rerepositioning them. So that’s really what’s cool about this. Just one last thing I have to say about neuroscience with this, that again after I wrote the book, I wasn’t aware of this before, but about a year after I was contacted by a chiropractor who he said you know, what you’re doing is memory reconsolidation. And I said What’s that. He said Well researchers have found that across species, I don’t care whether it’s a rat or a crab or a human being, it’s been tested on all of them, that when we pull up a memory, if we pull it up viscerally. So That we are actually feeling what we felt in that experience and we pull up that memory, the neurons that hold that memory in place unlock from each other. The synopses unlock and they remain open for about a five-hour window and they’re looking for new information. They want to see this memory actually accurate. And if it gets no new information to disconfirm it then they relock where they were. But in that five-hour window if you can show some new information then they can reconfigure and the memory literally changes neurologically. So what he said about what you’re doing Doctor Perkus, if you are giving those three steps that are needed for memory reconsolidation you’re doing in your 12 steps and the essential oils are the new information. So the sense of smell that tells you actually everything’s OK. That’s the new information that the neurons are looking for. And when your present neurons with that new information then there like hey this is OK I don’t need to be held back by that anymore. So it’s really exciting to think about how we can take this and how we’re literally changing memories in a very dynamic way. Benay: [00:41:22] Wow. I mean the thing that I just heard there is like forty-five minutes spread over across the period of three days. You can actually totally change a memory and recover yourself, like how cool is that? It’s so exciting. It’s not a hard process and it’s not painful. It’s just graceful and easy and efficient and fast. It’s incredible. Dr. Benjamin Perkus: [00:41:47] You know I remember one person saying that you know they love the most about it is its simplicity. And I said yeah I could have read an 800-page book that had about three million steps. Would that have been better than a simple process? Of course not. The simpler the better. And it’s just a matter of trying it and experiencing it. And then you realize. oh well That was easy. Now I’m gonna work on something else. Now I’m going to work on something else. Benay: [00:42:11] Yeah. Wow. I mean the contribution that you’re making to humanity despite, having written this and now teaching it to so many practitioners is just incredible. Love it. Ok, just switch gears just for a second now. We’re going to wrap up and I just want you to sort of think about the listener’s, you know the coaches listening to this podcast episode. And just given your experience and your background and everything, what advice or knowledge which you most like to give to those people who are either running a coaching business or they’re just about to start one where they’re in those beginning stages? Dr. Benjamin Perkus: [00:42:51] Yeah well I mean first I would say as I said before that it’s an inside job first and that you can only take people as far as you’ve gone yourself. So the more you can do to deal with and to improve on your own, whether it’s anxiety, whether it’s motivation, whether it’s commitment, follow through, you know identify areas that you want to improve. And whether you do it yourself through a self-help technique like this or you obviously should coach yourself but you know work on yourself first or at least alongside everything else you’re doing and then you’ll break through barriers because the journey of success is also a personal growth journey. And the more you succeed the bigger problems are going to come up. Sorry to break it to you but it’s true that the more you succeed the bigger problems you have, now they have larger dollar amounts associated with them, could bring up stuff. You want to make sure you have tools to keep yourself in the flow and if you have the tools in your toolbox and the people surrounding you that will help you when you’re encountering those inevitable challenges, and that will kind of keep you flowing in a positive direction. So that’s really my advice is that you know just be prepared for the journey and have the tools at your disposal that you can really enjoy the journey. Benay: [00:44:04] Yeah I love that, because it’s kind of like you actually do never arrive to your successful coaching business because there is always the next thing, and the next thing, and the next thing, so it is I think I love that, having tools to keep yourself in flow is a great parting pieces of wisdom. So thank you very much for sharing that. All right. If our listeners want to learn more about you, get a hold of some of your work, what’s the best way they can get in touch with you? Dr. Benjamin Perkus: [00:44:33] The best ways the website just www.aromafreedom.com and at aromafreedom.com we have books, we have training videos, we have online courses with a certification course. we do tell people that they are welcome to learn the technique and do it on themselves, family, and friends, you know just from the book. But if they want to charge for the technique then they need to become certified or they need to if they want to integrate it into something that they’re charging for they need to become certified. So all that information is right there on the website. And I did put together a special area specifically for coaches so AromaFreedom.com/coaches is going to take them to an area that write up some specific things, starter kits and things that will help people really jumpstart and help them get where they want to go and if they don’t see something that seems like the right match for where they are, just reach out with the, we have something on the website. We’d love to customize trainings as well. And we do trainings online. Most of what we do really is online. We also we’re in Santa Barbara California. We have in-person certifications here as well. So www.aromafreedom.com is how you learn more. Benay: [00:45:45] And if You want to add /coaches you’ll find this office specifically for coaches. Excellent. And I’ll Include that URL in the show notes if anybody didn’t catch it. All right. Well I think that is concluded, that’s feeling nice and complete for me, Dr. Benjamin Perkus. Thanks so much for being on the show and sharing your technique with me and my audience today. Dr. Benjamin Perkus: [00:46:09] Well my pleasure and I really want to honor and thank you for all the work you’re doing to support the field of coaching and just empowering people with the tools and the education that they need. So thank you for having me. Benay: [00:46:21] Absolute pleasure. Thank you listeners. And please go and like the show on iTunes, that sends us good karma and extra attraction which we love. Happy coaching everyone. Have a great day. Benay: [00:46:34] Now before you take off I’d love to ask you one question. Have you been sitting on a coaching business idea for too long? I know that’s not all of you but some of you, I know you’re out there. And I just want to tell you that it kills me when I have conversations in my discovery calls with coaches who are you know trained up to the hilt. They’ve got heaps of experience, either in coaching or in their own life experience and they’ve got a program, they’ve got a calling to do a certain piece of work, but they just really don’t know how to get started. If that sounds like you, I’d love to talk with you. In our 30-minute interview, I’ll be able to help you identify the number one thing that will help you fast track your coaching business. I’ve been working with coaches for so long and just a short conversation and some background information, I can see a whole lot that you might not be able to see. So you’ve got nothing to lose. Jump on the line with me and let’s have a fast track call. You can book that in at universalcoachingsystems.com/fast-track/.